Cat stuck in a tree? All in a day’s work for the San Bernardino County Fire department, even when the reported ‘cat’ turns out to be a mountain lion. Ho-hum, firefighters of the SBCF must have thought: another day, another cat stuck in a tree. 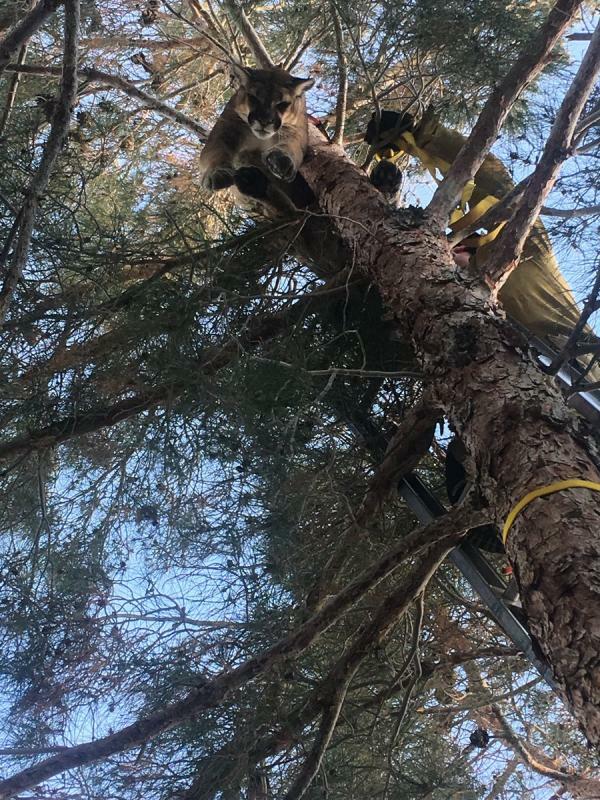 Rescuing tree’d cats is a no-brainer for these guys, seeing as they’ve got ladders and thick gloves on hand – literally, in case of the latter. This day was a little different, however. 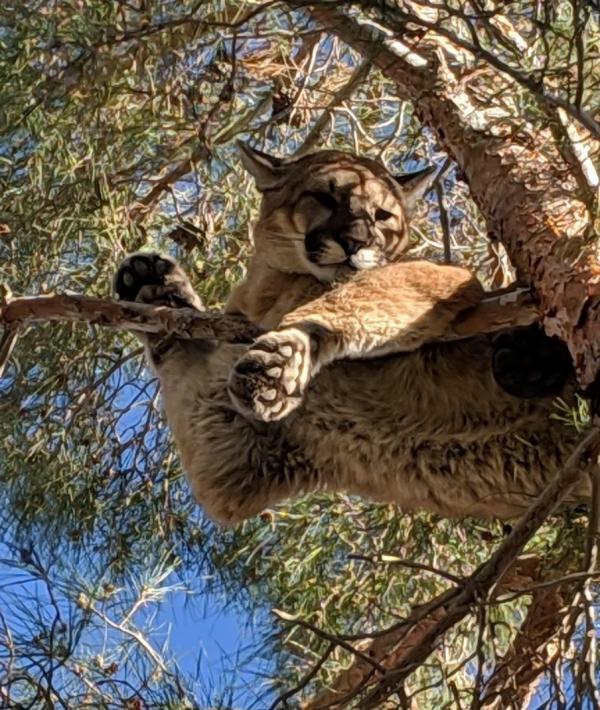 One can just imagine the reaction from the engine crew of Station 202 as the firetruck rolled up to the house in Hesperia, CA, and saw a “large” mountain lion out on a limb – also literally. Yeah, those gloves don’t do nothin’… they called in backup from the San Bernardino County Sheriff and the California Fish & Wildlife service. Mountain lions, especially large ones situated 50 feet up a tree in a residential area, are not to be taken lightly, nor are they taken down easily. The three services put their heads together and worked out a plan beneath the steady gaze of the toothy feline. After securing the area from residents and passersby, Fish & Wildlife personnel succeeded in tranquilizing the wary carnivore. Once judged to be suitably woozy, County Firefighters deployed an extensible ladder to reach the lion, which was then secured into a rescue harness and gingerly lowered to the ground below. Last but not least, Fish & Wildlife staff examined the purring (or was it snoring?) kitty while it was under sedation. “It is common for young mountain lions to wander outside what some would consider normal habitat in an attempt to establish their territory,” explained Fish & Wildlife biologist Kevin Brennan. A tree-lined street in Hesperia wasn’t a good choice. Live and learn, young mountain lion! Time will tell if the learning part sunk in but at least the creature – and everyone else concerned – lived through the ordeal. “Once the lion regained consciousness, we ensured he safely returned to his suitable habitat,” stated Fish & Wildlife Warden Rick Fischer. “Leaving the lion in the tree would not have been safe for the community,” Fischer added. Gee, ya think? 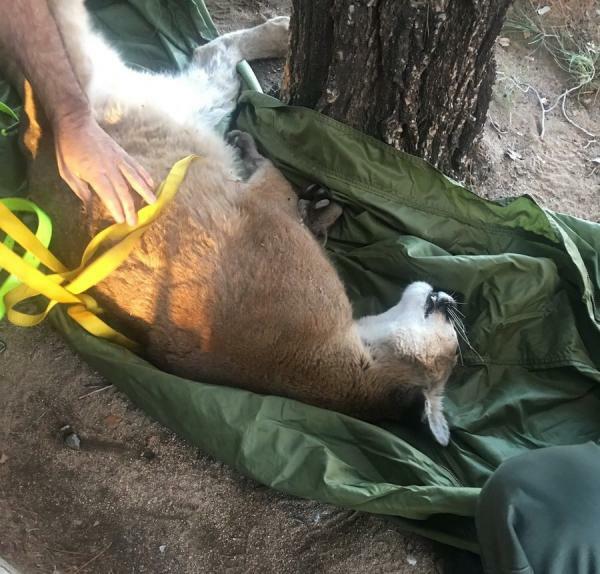 Kudos to Fischer for acknowledging the help of San Bernardino County firefighters, as “it would have been difficult to extract the animal safely” without their proven cat de-treeing expertise.